Description - Patchouli has a sweet, earthy, herbaceous, and smoky aroma. The benefits include having the ability to cure apathy, dry skin, ease confusion and indecision, balance endocrine glands, and as an aphrodisiac. It is also stimulating and rejuvenating and can stimulate the nerves. Patchouli blends well with Mandarin, Ylang-ylang, Jasmine, Myrrh, Rose, and Cinnamon. 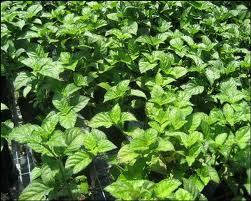 Patchouli is an antiinflammatory, antiseptic, antifungicidal, and has been used in the treatment of obesity. It has been known to reduce appetite and fluid retention as well as anxiety and depression associated with being overweight. Effects on the Mind - Helps to find peace of mind and is a great aphrodisiac. Effects on the Body - Great skin care ingredient and cell rejuvenator. Note - Base. Patchouli is a great fixative ingredient (a fixative is a substance that binds other compounds, slowing down their evaporation and thereby making the fragrance last longer). Blends Well With - Geranium, Rose, Citrus oils, Vetiver and Sandalwood, Cedarwood, Clove, and Neroli. Cautions - Do not apply this oil directly to the skin without being diluted in a carrier oil first. No known toxicity. GRAS (Generally Regarded As Safe) approved by the FDA as food flavor.